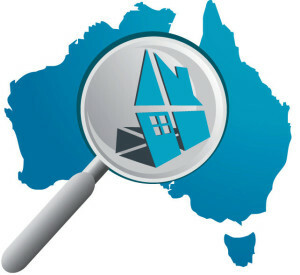 The Australian Bureau of Statistics have just released their latest residential property price index. 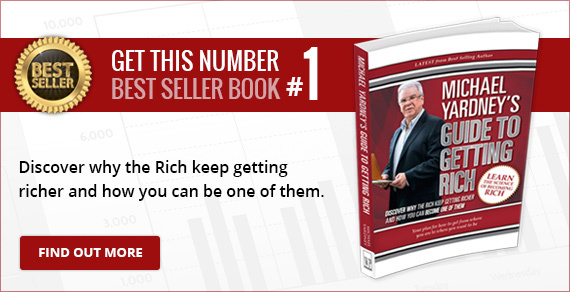 This index lags the big commercial research organisations – they’ve only just released their December price index, but overall its probably the most accurate index. The price index for residential properties for the weighted average of the eight capital cities rose 4.1% in the December quarter 2016. 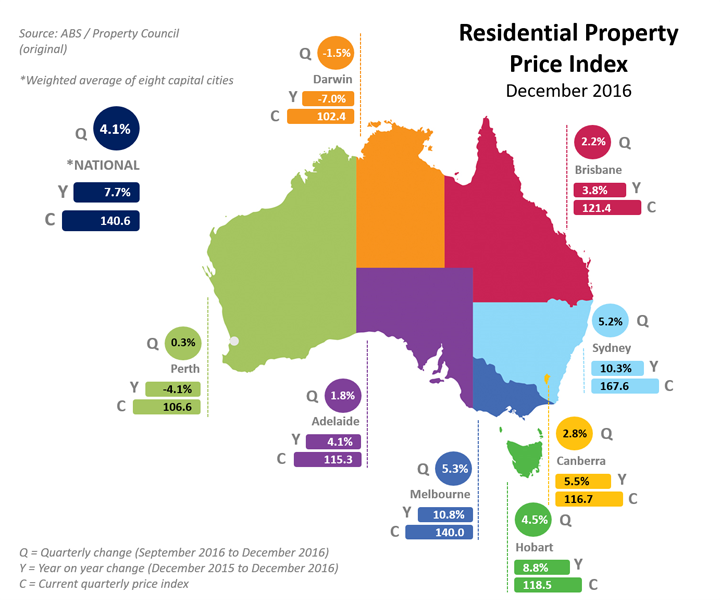 Annually, residential property prices rose in Melbourne (+10.8%), Sydney (+10.3%), Brisbane (+3.8%), Adelaide (+4.1%), Canberra (+5.5%) and Hobart (+8.8%), and fell in Perth (-4.1%) and Darwin (-7.0%). 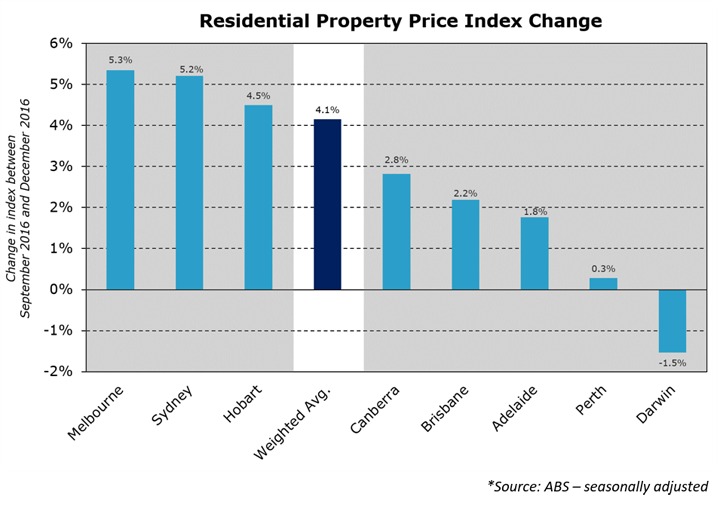 In the last quarter the capital city residential property price indexes rose in Melbourne (+5.3%), Sydney (+5.2%), Brisbane (+2.2%), Adelaide (+1.8%), Canberra (+2.8%), Hobart (+4.5%) and Perth (0.3%), and fell in Darwin (-1.5%). 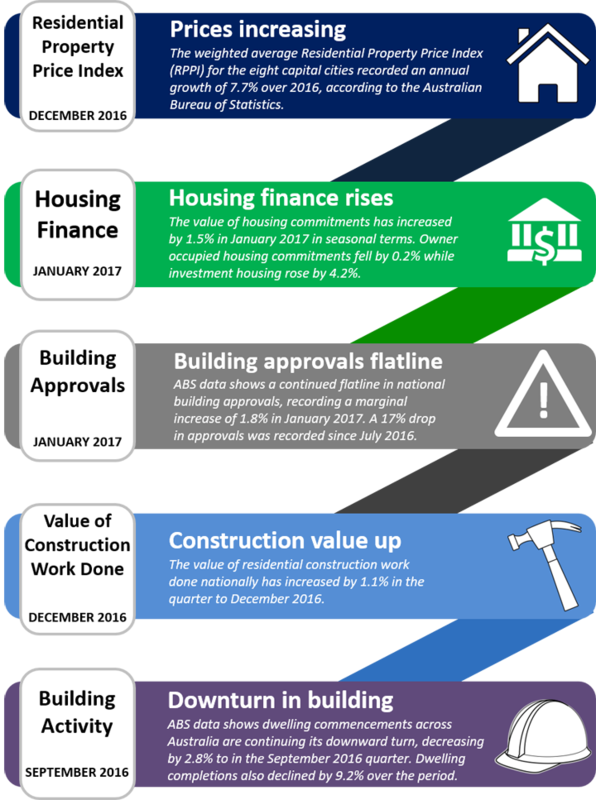 The total value of residential dwellings in Australia was $6,438,537.3m at the end of the December quarter 2016, rising $274,160.0m over the quarter. 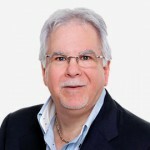 The mean price of residential dwellings rose $25,400 to $656,800 and the number of residential dwellings rose by 39,600 to 9,802,700 in the December quarter 2016.